In the Spanish version of the menu, that one of course is Calamares en su tinta. 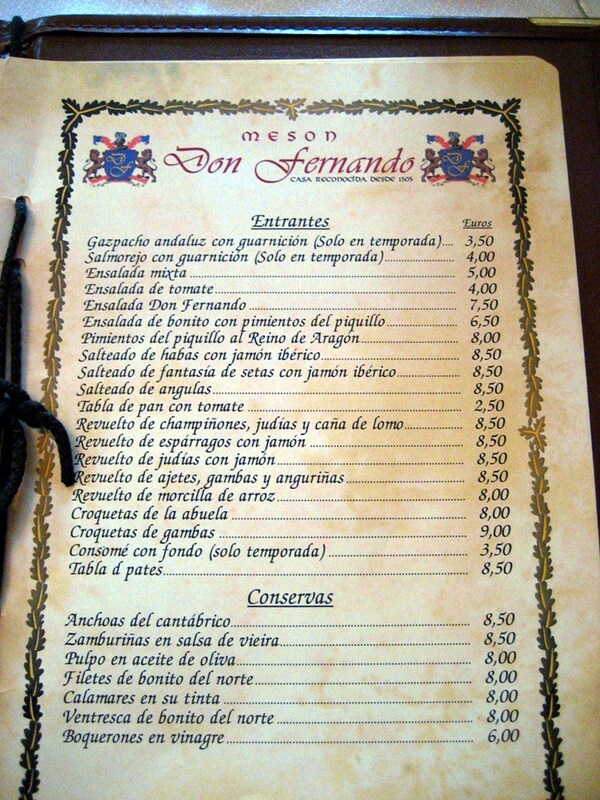 The full English and Spanish versions of this menu page are here and here. "Attacked of fantasy of mushrooms"? "Attacked of elvers"? What is this, Middle Earth? If I saw that on a menu I would be all over it. 'Secreto' is a cut from the Iberian breed of pig, not from the normal breed. 'Secreto ibérico' would be perfectly normal on a Spanish menu. 'Revuelto' by itself does mean scrambled eggs. 'Nice of the north' on the full menu is 'bonito', the name of a fish (a kind of tuna) but also the Spanish for 'nice'. Cane of loin is also an odd (but straightforward literal) translation. You are correct that revueltos de X = scrambled eggs with X.
I wasn't previously aware of all of those variations of the Iberian product at the end of the list. But I do find that I can buy them locally in Virginia, so that's nice. Pluma ibérica (the source of that funny last item) is hard to translate in any case; it's an exclusively Spanish cut from the tail end of pork tenderloin, for which I don't think there's a term in any other language (or dialect of Spanish, for that matter). Secreto is a lean cut often mistranslated as ‘skirt steak’, but in fact taken from the fore shoulder. I thought at first that the Iberian Pen (Feather) was calamares but having it under "Meets" rather than "Feesh" makes that unlikely. And "prey" might be "game", come to think of it. It turned out that "cervical cancer" was the Google-Translation of Polish szyjki rakowe 'crayfish tails'. I couldn't quite believe the story until I checked GT myself. It takes Artificial Intelligence to blunder so spectacularly! P.S. Don't ask me what "beetroot carpaccio" is. I haven't the dimmest idea. I would imagine "beetroot carpaccio" is a plate of very thinly sliced beets, but I could be wrong. I guess "pens to the angry one" is "penne all'arrabbiata". Another page of the menu had "pens to you escape him" – ? 'Presa' is Spanish for 'prey' but is also a cut of pork. 'Caza' is the Spanish for 'game'. I don't know about 'cervical cancer' but I have seen 'dumbfounded sky bacon' and 'fragmentation hand grenade' on the same Spanish menu, for 'tocino de cielo' (a dessert) and 'piña' (pineapple). The two separate elements of szyjki rakowe in the version of Google Translate I'm accessing come up as "neck" and "cancer", but put them together and the programme does give "crayfish". Elvers are young eels which have not yet swum downriver and out to sea. @Zytophile: It gave "cervical cancer" only a few days ago. They must have fixed it after all the laughs that the British press had over it. You mean upriver from the sea. Eels breed in the Sargasso Sea. There was a can in the pantry of my childhood home labelled "Squid forced in its own ink". This must have been imported from Spain or Portugal (I forget which) before World War II. The latest citation in the OED for "force" v3 is a 1747 cookbook. You're right, Piotr. I confused the breeding habits of eels and salmon. Elvers are still young eels, however. Many years ago I found, on a menu in another place in Andalusia, "calf to the board" (ternera a la plancha). This was of course in the days of word-by-word dictionary look-up, not machine translation. But elvers have swum upriver from the sea (or started to, at least). Before that they're in a still younger form known as "glass eels". Although it's not a translation problem, I am a little taken aback at the parallel constructions croquetas de gambas and croquetas de la abuela. It's "Buffalo wings", not "buffalo wings". Alon Lischinski: "Pluma ibérica (the source of that funny last item) is hard to translate in any case; it's an exclusively Spanish cut from the tail end of pork tenderloin, for which I don't think there's a term in any other language (or dialect of Spanish, for that matter)." I believe the same cut is called "pisanica" in Croatian, and that literally means something written (pisati = to write), which seems to have a semantic connection with "pluma". I once came across "coriands" on the English menu of a Thai restaurant in Denmark. This presumably wasn't a machine translation error, but caused by an incorrect assumption that the Danish word "coriander" was the plural of "coriand". If you travel much, you see a lot of this on menus. Some of my ESL students rely on bilingual dictionaries. They don't often produce truly crazy English, but they often come up with inaccurate words and phrases that are hard to comprehend. Sometimes their writing reminds you of results from Google Translate. Sometimes when my students use their dictionary/translator they choose a word which technically has the same or similar meaning, but is use only in very restricted contexts. For instance, a student said that they 'disdained' a particular food (I can't remember which). @Eugene @ David Morris: Yes, this is one of the hardest things to master when learning a new language: when to use various synonyms. As an ESL speaker married to a Brit, I know from experience that it takes a while to get it right! I speak no Croatian (or any other Slavic languages, for that matter), but <a href="http://www.proz.com/kudoz/croatian_to_english/food_drink/3315434-svinjska_gove%C4%91a_pisanica.html"translators seem to think that pisanica is the tenderloin. Anatomically speaking, that would be the psoas major muscle, and the corresponding pork cut is usually called solomillo. Pluma, on the other hand, is the rhomboid major muscle (located near the cervical end of the psoas). Sometimes the lumbar end of the extensor spinae muscle, where the iliocostalis, the longissimus and the spinalis are bundled in a large mass, is also sold under this name, but that's more properly known as punta de lomo. I speak no Croatian (or any other Slavic languages, for that matter), but translators seem to think that pisanica is the tenderloin. Anatomically speaking, that would be the psoas major muscle, and the corresponding pork cut is usually called solomillo. There isn't one, but it would be nice if there were a better translation of "revuelto de x" than "scrambled eggs with x". "Scrambled eggs" is accurately expressed in Spanish as the plural "huevos revueltos," and scrambled eggs with mushrooms is "huevos revueltos con setas". But the singular "revuelto de setas" or whatever means a dish which is principally the mushrooms or whatever, eggs are present but are secondary – a revuelto for four people may only contain two eggs or even one. So I think there is a good case for leaving "revuelto" in Spanish. @ Coby Lubliner – if pigs could fly, how great would those wings taste? @Coby Lubliner: And then of course there are chicken fingers, which should go nicely with b/Buffalo wings. Which in spite of etymology, I've often seen advertised with the image of an alate bison. @dan milton: Pace OED, "force-meat" or "forcemeat" is a perfectly good contemporary term for a meaty stuffing, and widely used in current cookbooks. The derivation would appear to be the French "farci" (stuffed) – which I have learnt, to my cost, is a better term to use in France than "plein" to indicate that one is extremely full of food. I suppose the "cervical cancer" mistranslation is related to the zodiacal Cancer, also a crustacean? … it would be nice if there were a better translation of "revuelto de x" than "scrambled eggs with x". "Scrambled eggs" is accurately expressed in Spanish as the plural "huevos revueltos," and scrambled eggs with mushrooms is "huevos revueltos con setas". But the singular "revuelto de setas" or whatever means a dish which is principally the mushrooms or whatever, eggs are present but are secondary – a revuelto for four people may only contain two eggs or even one. So I think there is a good case for leaving "revuelto" in Spanish. the French "farci" (stuffed) – which I have learnt, to my cost, is a better term to use in France than "plein" to indicate that one is extremely full of food. This must be a relatively new usage, a literal translation of English "stuffed" in the context of a dish, not of one's stomach. Before that (and still now), you could say "J'ai le ventre plein" (my belly/stomach is full) or "J'ai trop mangé" (I ate too much) or "J'ai plus faim" (I am no longer hungry), but indeed never "*Je suis plein(e)". @Tino: yes, you're on the right track. 'rak' for example means (1) crab, (2) cancer (the disease) and (3) cancer (the astrological sign) in Croatian. 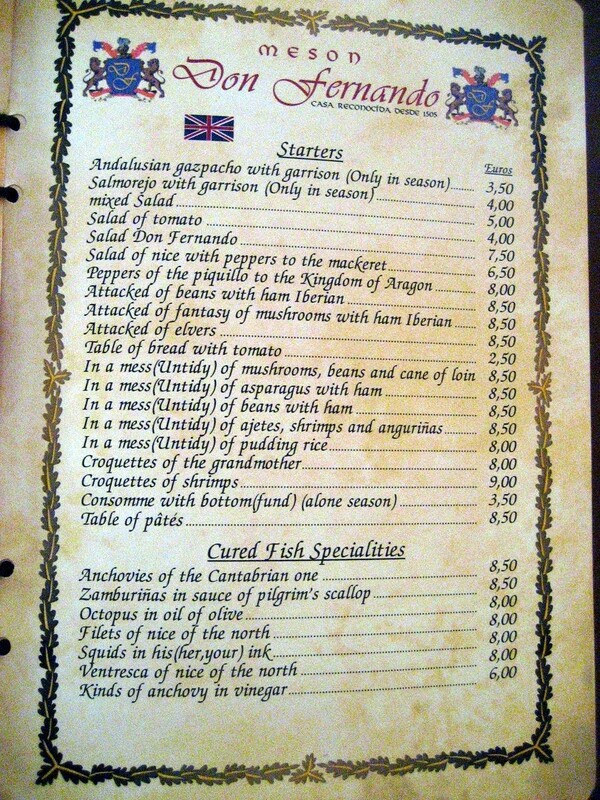 So if you see 'cancer' on a menu in a Slavic-speaking country, think seafood! In Polish there is 'ogonówka' (roughly "the tail part", as 'ogon' is 'tail'), which might be equivalent of 'Pluma ibérica'. In French, _plein/e_ is used for animals to say they're pregnant, so yes, to say "je suis pleine" when in English "I'm full" would be appropriate never fails to attract slightly odd looks. Saltear does not mean "attack" at all. You or the guys that "translated" that menu probably confused with saquear, "to loot", or, more probably, with asaltar, that means "to assault". Saltear can only mean "to sauté" (if you can use that word as a verb in English, I am not sure), or, more transparently, "to leave something aside, to skip something". I don't think the restaurant owners were very literate in Spanish either.